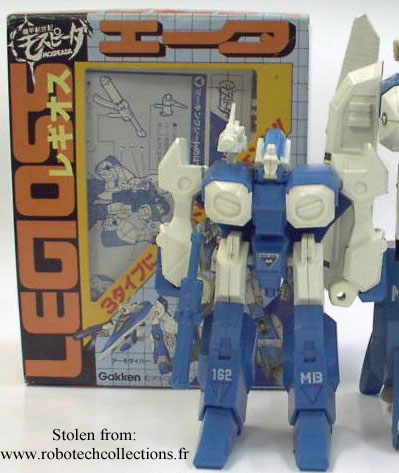 This is the absolute base model in the world of Gakken Legioss/Alpha toys and the packaging reflects this. 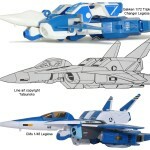 This toy could be purchased in a large variety of giftsets and as a stand alone product. 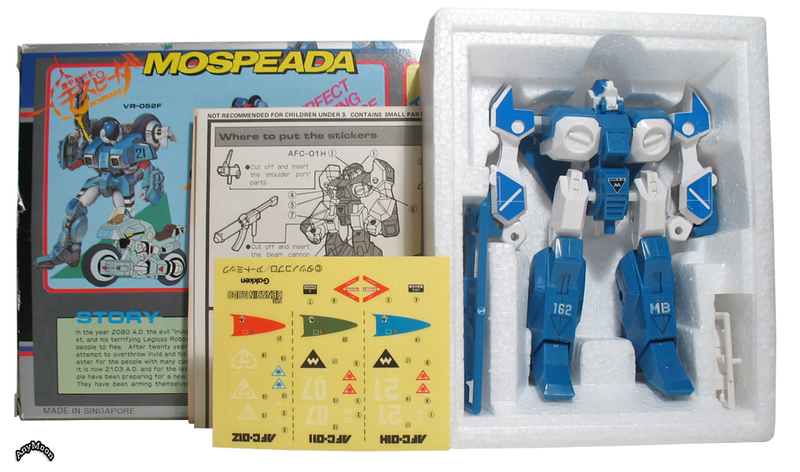 The stand alone product was released in a box in Japan (behind the Legioss next to the Tread above), in a box internationally in the Henshin Robo line (not pictured) and on a blistercard under the Robotech label (first picture above is a water-damaged blisterard). 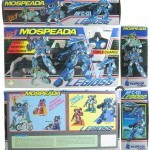 The most common giftset the toy was available in contained the 1/72 Legioss toy and a 1/20 transformable ride armor. 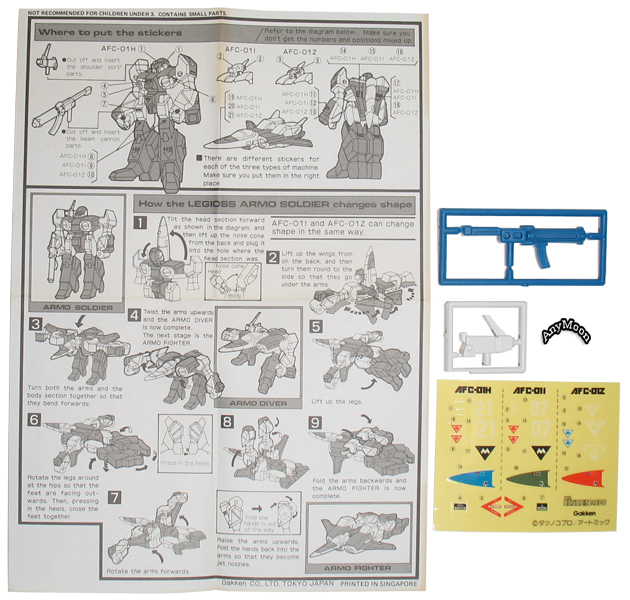 All versions of the toy come with a shoulder-assembly and gun on sprues as pictured below. 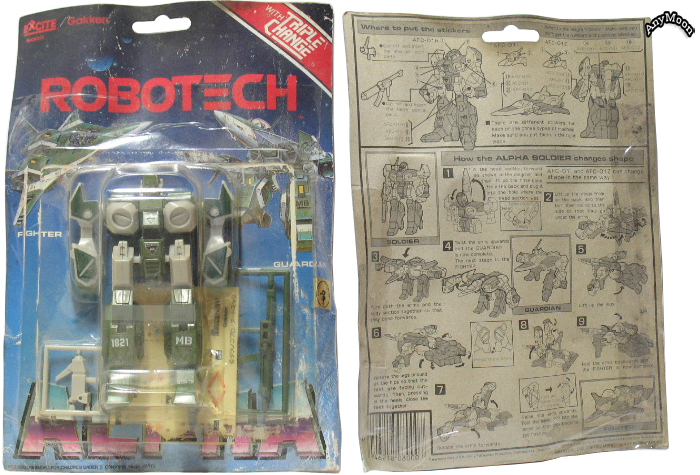 The toy also comes with a generic sticker sheet. 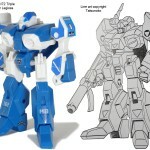 Applying the stickers greatly improves the overall look of the toy. 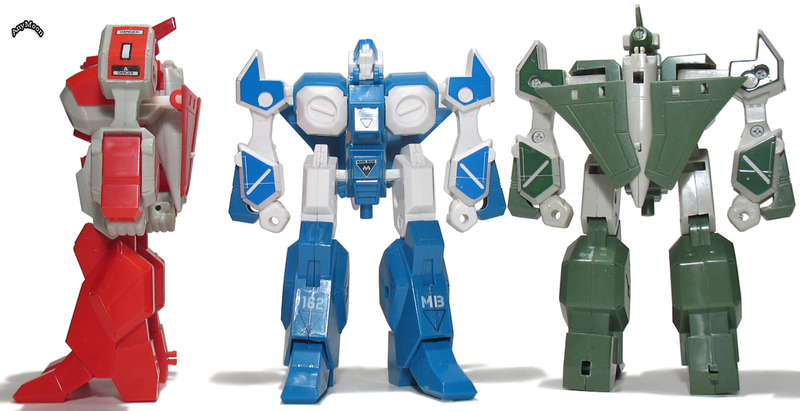 Please note, I didn’t have the heart to remove the shoulder-amount assemblies or guns from their sprues so the toys look a bit naked in soldier (battroid) and diver (Guardian) modes. 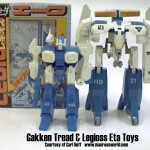 As the cheapest Legioss/Alpha toy produced there isn’t a huge market interested in collecting this particular toy. A boxed version of the toy would certainly be more desirable than the blister-card variety. While this product on its own may not be entirely desirable I have come to learn since I originally posted this review that there is a fair amount of demand for the giftset bundles and the Japanese release. 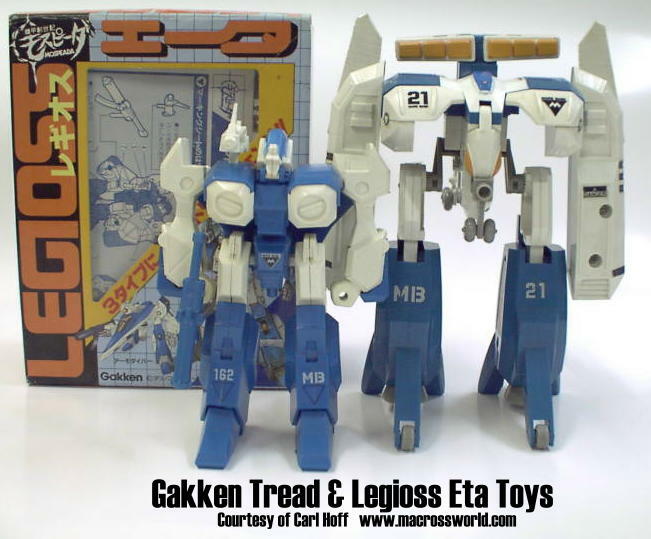 Easily the most sought after giftset is the bundle that included this toy and the super rare Gakken of Singapore Tread (Beta). 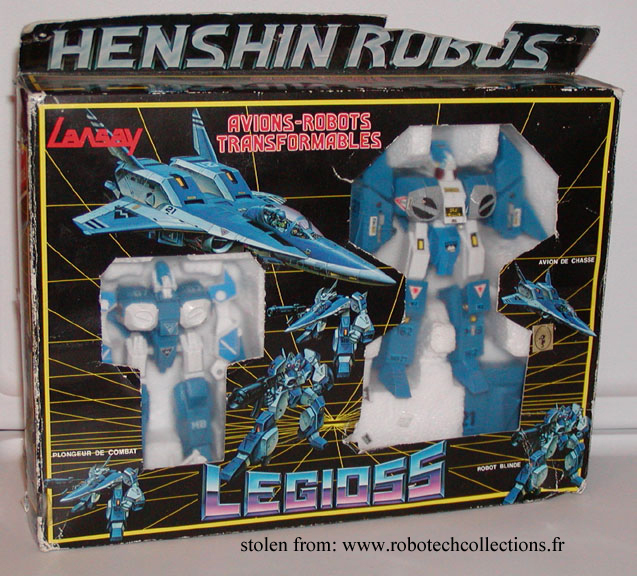 Another rare giftset included this toy and the Gakken 1/55 triple changer (like the rare Legioss/Tread giftset, this too was sold by Lansay in France). I have no intention of purchasing these various giftsets so I’ve resorted to stealing pictures from http://www.robotechcollections.fr/ (and my thanks to the proprietor of said website who I believe visits here occasionally). The battloid/soldier version of this toy doesn’t look half bad. 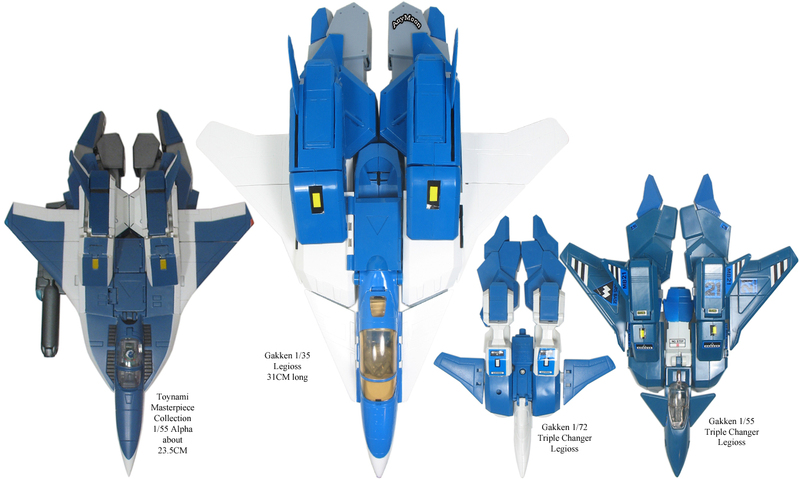 As the transformation progresses to armo-diver (Guardian) to fighter mode this thing moves further and further away from resembling what we saw in the cartoon. 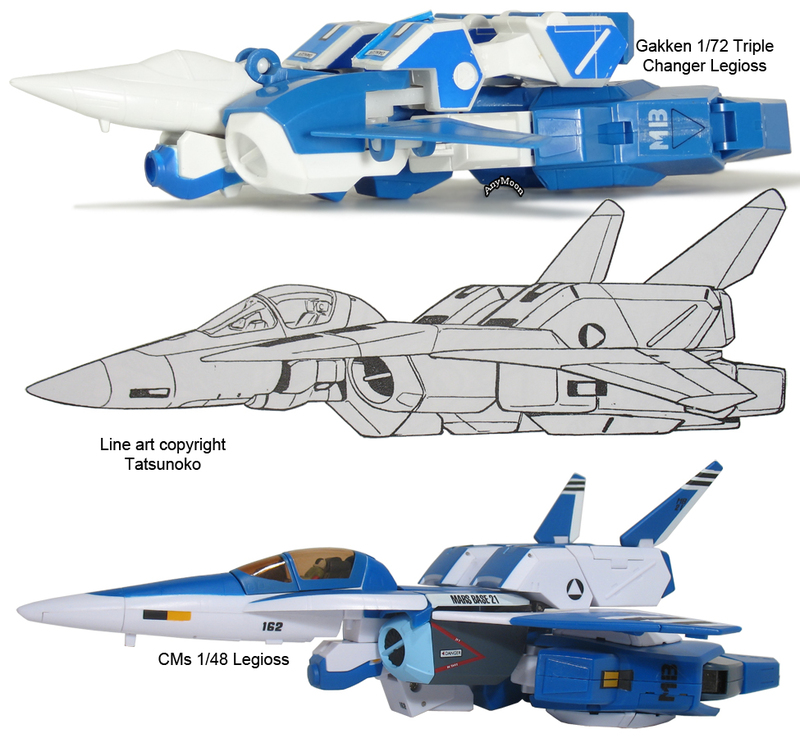 Fighter mode is one step away from an abomination. 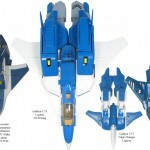 The only time this thing does look good in fighter mode is when the Tread toy is attached to it but only a few people will know that from first hand experience (or by visiting http://www.robotechcollections.fr/). 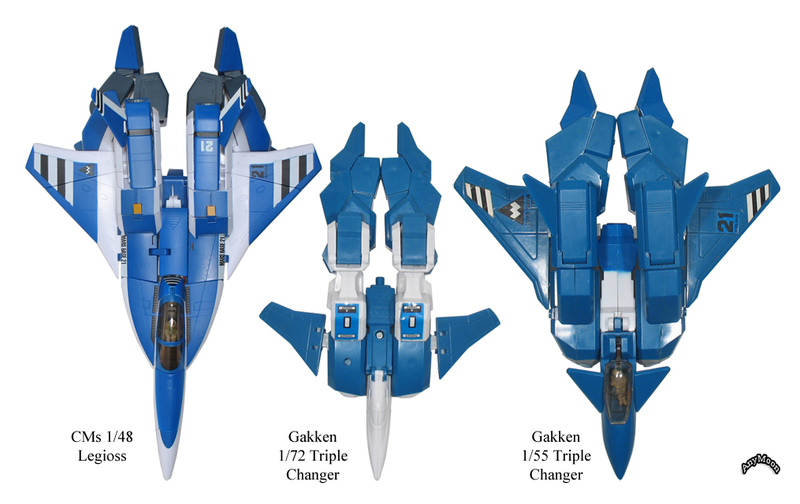 As with all Gakken Genesis Climber products, the paint job, or lack thereof, doesn’t do much to stick to what we saw on screen. This thing gets a few points for maintaining perfect transformation in such a small scale but that’s about it. It’s honestly very hard to find other examples of where this toy succeeds. To put it in context, the Toynami Morpher is slightly more sophisticated. There are no collapsing parts here and no tail fins for the arms. It’s a small toy made of very thin plastic. 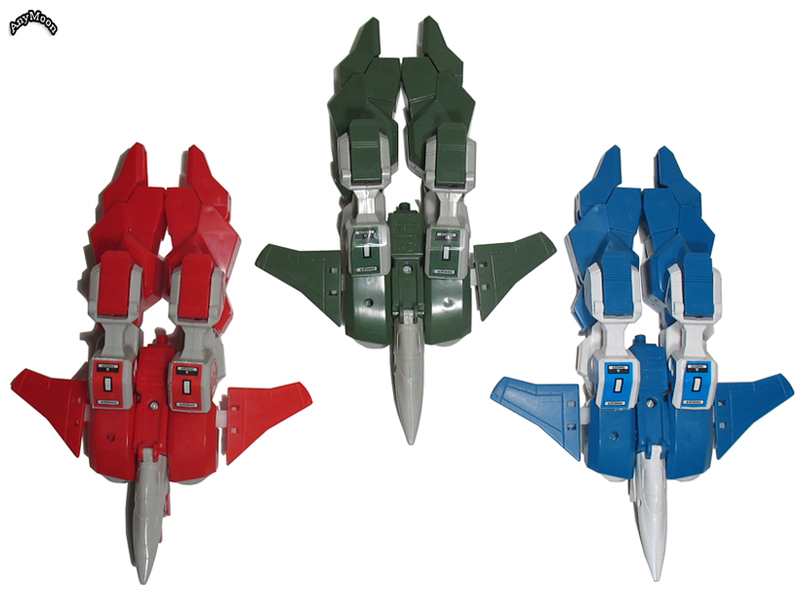 Since it has practically no range of movement (more on that later) it would be very easy for anyone to break this toy accidentally (the picture of the green Alpha below shows what happens when a user tries to move one arm independently of the other). It does feel fairly stable in Battloid and fighter modes due to a few clipping areas that keep the limbs from betting sloppy. The red version of the toy features a head fin that begins to separate as it ages down the seam in the middle (also pictured below). One final note, the toy comes with a gun that barely fits in the hole in the hand… apparently some users got their guns stuck and when they tried to remove them the gun’s handle simply snapped off in the hand (also pictured below). If you’re buying second hand check all the clips used for transformation and also look for random spots of discoloration. 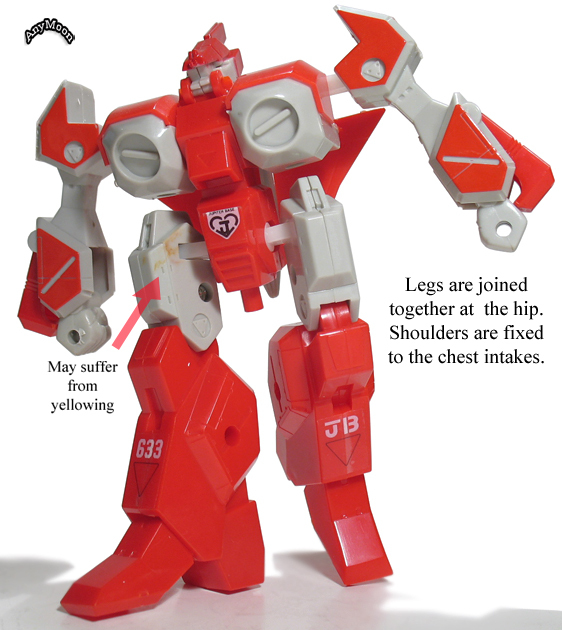 Other than the knees, if a joint isn’t absolutely necessary to complete the transformation process than it does not exist on this toy. Everything present is meant to allow the toy to get from one mode to the next. The arms are attached to the chest so they can’t be angled in the least when in battloid mode. The legs are attached to each other which practically renders the knee joints useless. This toy can only achieve static poses, nothing more. Calling this thing a toy seems wrong since there is really so little that can be done with it. What really makes this toy noteworthy is that it was sold at a price similar to an action figure. 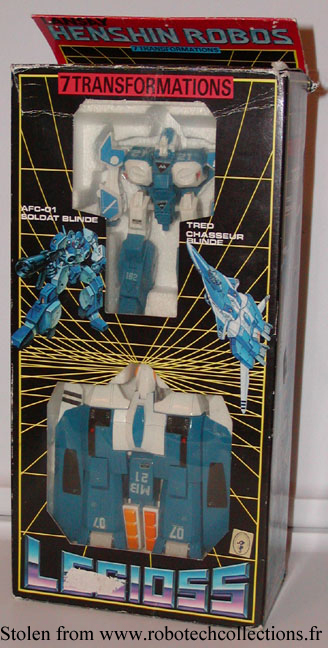 A transformable vehicle for the same price as a small action figure is a pretty interesting concept. Unfortunately, a small action figure would likely be a much better toy. Note: This review has been updated. Originally posted on May 21, 2006, additional pictures were added on December 11, 2006. The review was updated again on August 24, 2009 with all pictures being replaced with ones of higher quality. 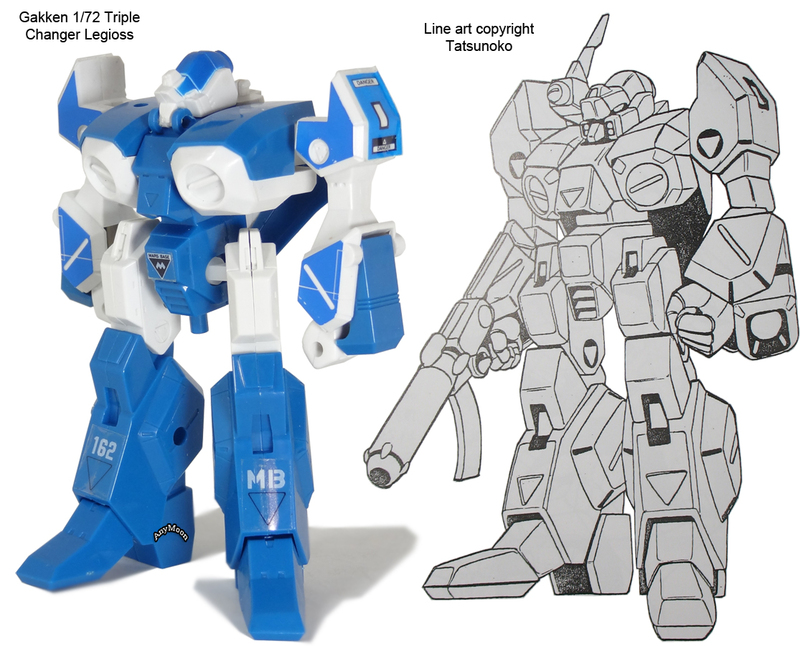 This review was updated again on March 21, 2012 to include line art comparisons, some improved pictures, and a video review. If you leave the shoulder pod on in Diver mode, it really helps the look. 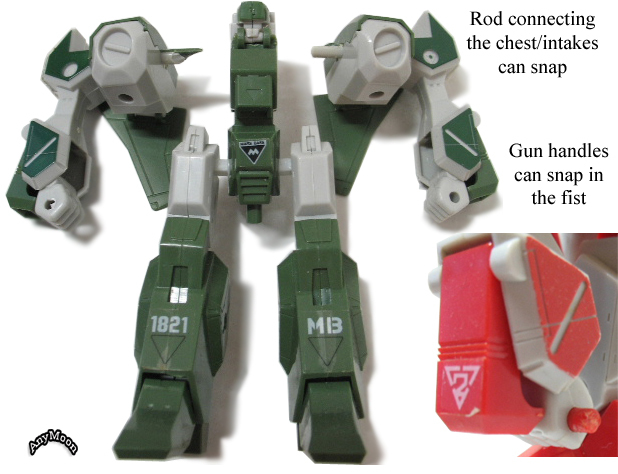 The shoulder pod is folded out in the anime :) This was my first Legioss toy so I have a nastalgic bond to these toys and I love them! Absolutely correct. Unfortunately, most of my shoulder-mounts are still on their sprues, that’s why I only have a few pictures of the blue Legioss/Alpha with the mount on. These toys definitely look better with their accessories attached and I’m sure they look even better when fully stickered up. 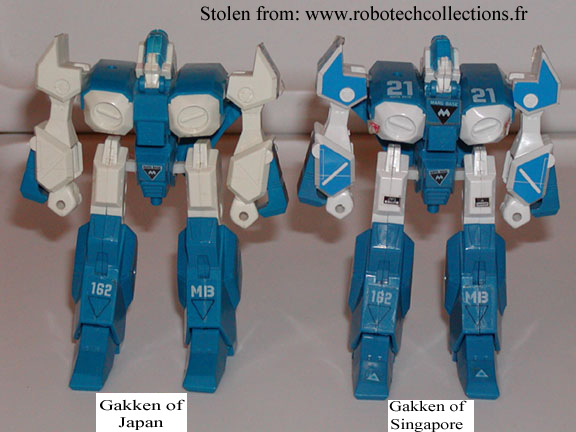 I don’t think all those pics were stolen from http://www.robotechcollections.fr/. Looks to me like a few of those were stolen by http://www.robotechcollections.fr/. This one for example. Not only was the right of the picture cut off but you can see what was removed from the bottom as well. Ah, I apologize Carl, I gave credit from where I took the pictures but was unaware of their origins (although I should have been because I’ve certainly cruised your work on MW at some point). Thank you for bringing this to my attention and for your contributions to Mospeada collecting. Sorry for not finding your original and including that the first time Carl. I have updated the page. please, someone show me where I can get hold of one? 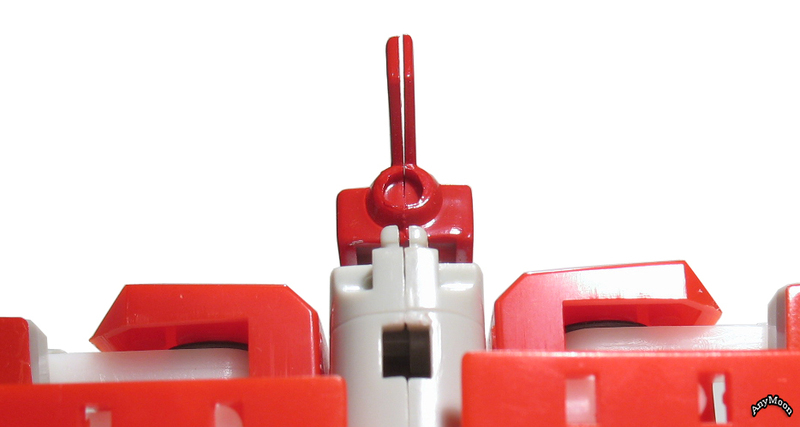 It’s worth noting that this toy has more sculpted detail than Gakken’s 1/55 triple changer. I wish these things were widely available today. I would love a Legioss and Tread in this scale. 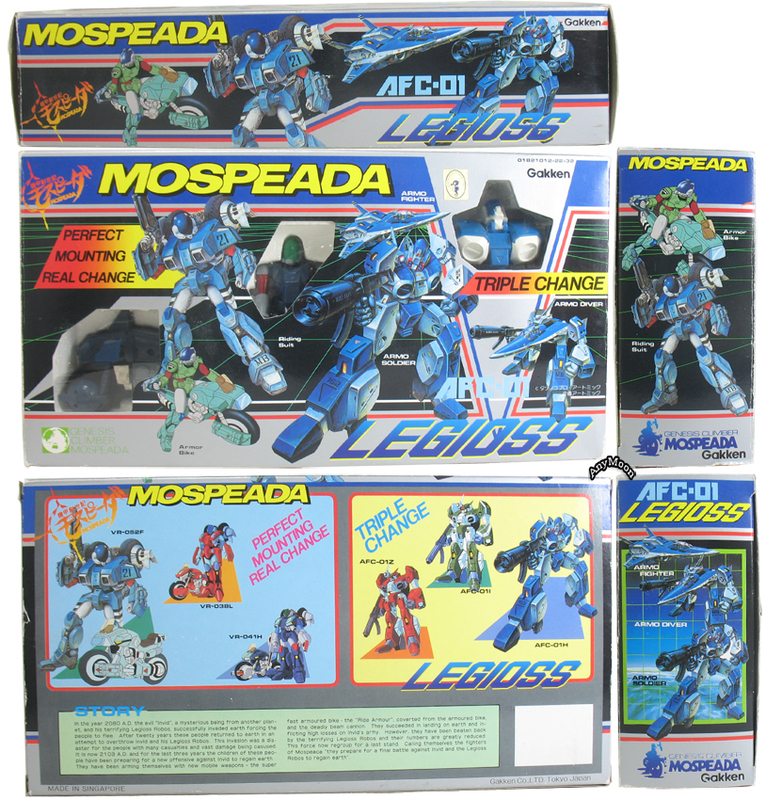 It’s a terrible shame that there isn’t more love for Mospeada in collectors’ circles.